Often, when people think landscape photography, the first thing to come to mind is wide-angle shots of grand vistas. There's nothing wrong with this but telephoto lenses can add creativity to your landscape photography by narrowing the field of view, enabling you to pick out highlights of a wider scene and concentrate on what catches your eye. One of my favourite tips I give people is beautifully phrased by American wilderness and landscape photographer, Joshua Cripps, who says: "fill the frame with what you like". One of the best ways of doing this is to use a telephoto lens. Zooming in can help you fill the frame with your subject and eradicate unnecessary and distracting elements from the periphery of the frame but when combined with moving your shooting position, it can offer much more creativity in balancing the elements of a scene to create a composition that you like. 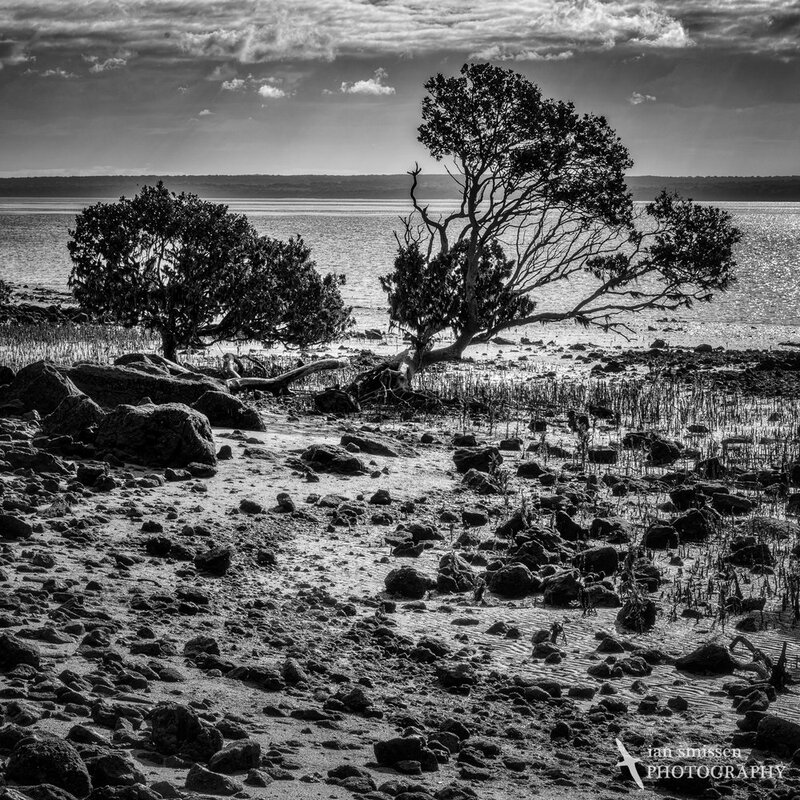 Tenby Point on Westernport Bay (ironically, east of Melbourne) has a beautiful sandy beach with mudflats, exposed brown and red-coloured rocks and several mature and ageing mangroves (Avicennia marina) that make great subjects framed by the usually still waters of the bay. I intended to visit this location at high tide early in the morning but the weather was distinctly uncooperative - when I arrived there, it was bucketing down with rain and the wind made it impossible to even use an umbrella. So, I took the opportunity of being a tourist for a few hours, waiting out the weather. By early afternoon, the sun had broken through but it was now low tide on the beach, which meant I couldn't shoot the mangroves in the silky smooth water. Instead, I opted to look for some backlit shots of one or two mangrove trees, separating them out from their surroundings using a 70-200mm zoom lens. I found these two interestingly-shaped trees backlit by the sun. Using a telephoto lens from about 40 metres away, enabled me to isolate the trees from most of the distracting elements around them. The backlighting made this a high contrast shot so I shot 5 frames +2 to -2 stops around the 'ideal' exposure and blended them together using HDR in Adobe Lightroom. However, I did like the contrastiness of the image so when I moved a few metes back and to the left to reframe the shot enabling me to add a subtle leading line of the pathos pebbles from the bottom left of the image, I also processed the final image as B&W to emphasise the contrast. I also waited a few minutes for the sun to pop out from behind the clouds in the background to add the reflective sheen on the water. I really liked the smaller tree (on the left) and moved further along the beach to isolate it from the rest of the trees and rocks. I first looked at shooting it with a wider angle from relatively close up so I could fill the frame but standing so close to the tree and at the same height meant the dark band of the island in the background cut through the tree. Moving 20 or so metres back up the shore and standing on top of rocks elevated the camera above the tree height and separated the tree from the island in the background thereby emphasising the backlighting and reflected sunlight on the water. Again, I shot this as a 5-shot bracket but, in the end used just the -1 EV frame so I could retain the brightness in the ripples in the background. I also cropped this image square because I liked the balance better than horizontal or vertical rectangular formats. Checkout the video of this shoot (from my YouTube channel) including a demonstration of the effect of zooming in to telephoto focal lengths and the compression effect of using a telephoto lens and adjusting the camera-subject distance. Let me know what you think in the comments below - constructive criticism and debate are always welcome.